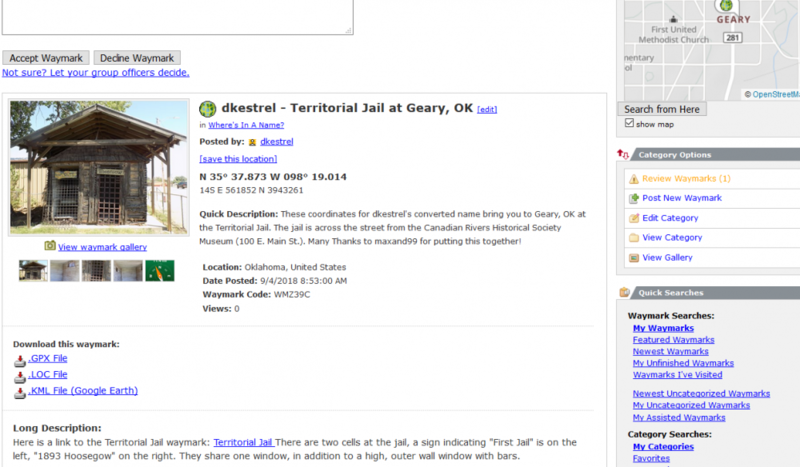 "It's rare but it can happen that an entire group loses interest in the publication of new waymark listings. While Groundspeak prefers to allow the community to resolve such things themselves there are times where it is simply not possible. Here are some suggested steps that can be taken. If you have an interest in helping with the publication of new listings then the best first step is to try to contact the Leader and ask them to invite you to be another Officer. You can do that through their Waymarking profile directly from the Group page. You can also try their Geocaching profile if they seem more active on that site. Whether you want to help or ultimately adopt the Group to become the Leader, this is best first approach. Make sure to save a copy of your attempts to contact the Leader. Hopefully they will appreciate your offer and things can progress from there in a way that is mutually beneficial. What if nothing happens after a week or two? At that point it is best to contact me directly to move things along. What I will need is a copy of your attempt to contact the Leader and a link to the Group in question. 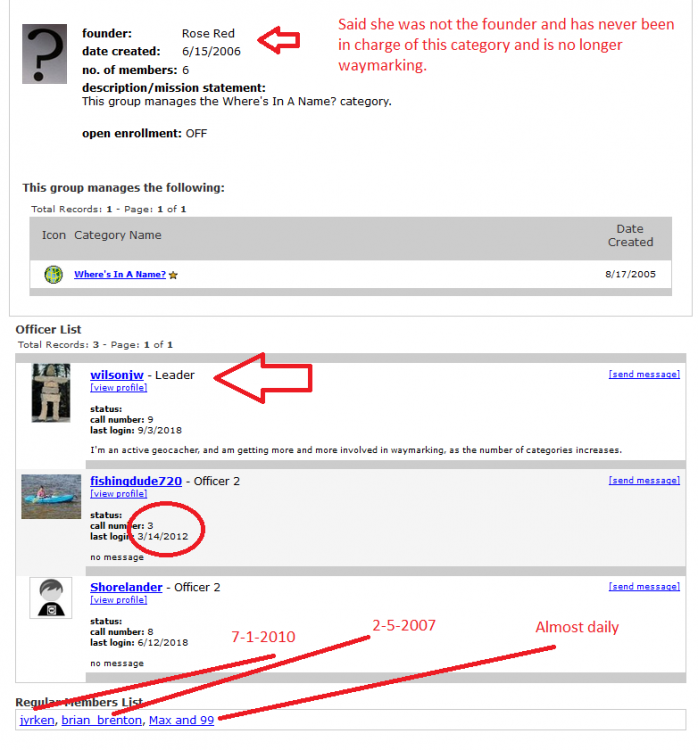 That allows me to see what is going on with the Leader and other Officers, clean up any pending submissions, and start the process of transferring the Group to you if appropriate. So I've become the Leader, now what? With your new role comes some new responsibilities. Some are fun and others not as much. Likely there is already a need to add new Officers and maybe remove some too. You can Open Enrollment and/or post in these forums that you are looking for some new bodies. Add carefully since you will want people that share an interest in the Category content. The Category itself might need some updating. Who better than you and the new Group? Be sure to open up the communication with the Group by enabling the Officers to email each other and the Group. Set a plan and expectations for how the updated Group will function. Remember, it is a Group and not just one person running the show. This is a community and it communicates. Everything is updated and ready to go. Awesome! Brag about it in the forums. There may be people that have given up on the category because of how it was being run before. Just like a restaurant, advertizing that your Category is Under New Management might be all it takes to attract some new submissions. If the listing has received no action or remains in vote for a longer than seven days you can contact Wayfrog to escalate the review process. Include the unique WM CODE found near the top of your Waymark listing page in your message. -> If you have waiting waymarks in a category and you are not interested in helping as an officer, your waymark will wait as long as another waymarker will start the process or you sent the WM Code to me. In addition to that I can make a clean up all two month. In addition to that I can make a clean up all two month. Can you explain what this means, please? Thank you for reminding us of the process. I thought previously we were to wait two weeks from waymark submission date before contacting you. One week is even better. There could be categories with new submissions combined with no interest in a new leadership or officer duties. Checking all categories every two month avoids waiting times beyond good and evil. I was wondering how to handle a submission that I made to the Pyramids group a month ago which has still not been approved. It appears that the officers for this group are not very active. I had emailed the only officer who has logged in during the 2018 year but received no response. My submission number is WMYTPY. Any recommendations? This is yet another category where wayfrog does our work for us. I ask to be an officer of this category following the Wayfrog process. The last waymark in the category I want to join took over a month to get reviewed. I sent a message to the only active officer saying I'd love to join but I never got a response. I have no interest in joining the Pyramid group but I was added as an officer. A mistake, or am I being punished for complaining too much? I have no knowledge of this category and would be useless as a reviewer! I did get to help out with a vote already. So I guess I'm not completely useless. Yesterday, I had a whole slew of older waymarks approved, including my Pyramid. Thank you, Wayfrog! I messaged the Officer in Where's in a Name on July 21, 2018 and did not get a response. I would like to be added as an officer. Currently there are only two officers to manage the category. What do you think about this problem of comprehension compared to a non validation of waymark, and threats when one brings all the proofs of its validity. In this group there is a leader (not operational since June 2017) and two officers, apparently only one valid or voting waymarks (only one answer in the votes). What can I do to have my good faith admitted? Funny how all of this works. I have been posting in several new categories and have several that are approaching the two week mark with no action. But tonight I submitted one in a new category for me and it was approved in just a few minutes. Guess they just happened to be "at work" when it hit their queue. I sometimes wait to have a waymark approved in a category where I could approve. When I see that the category needs something I assume it is my waymark. I eventually checked and it was someone else. I suppose if I approved my own waymark I wouldn't have this problem. WOW All I had to do was mention it here and wayfrog was all over it, four published last night. THANKS SO MUCH! When it regularly takes 10 days and more to get reviews, in my opinion the group that manages Firehouses needs an injection of active members as officers. There's essentially only 1 active officer, and not all that active, as attested by the > 10 day waits in all cases. 3 weeks waiting on review: Where's in a Name? It doesn't feel right reviewing the waymark myself since I did most of the work. Find someone reputable who'd be happy to take an unofficial field promotion to help you review your waymark. Everything's done in e-mail, of course, and when that person tells you that, hey, it looks good, go ahead and approve it yourself, and add a note in your Long Description that so-and-so was kind enough to help you out while the other category officers were MIA. Have you tried your idea yet? You can probably get volunteers here to help out with unofficial reviews. I thank that relying on wayfrog is slightly less wrong than self-reviewing. However, how far into the future will wayfrog be available to us? What is the category ? Great idea! I'll post a screen shot here and let you guys review it for me! Just need a minute. I REALLY hate bothering wayfrog and agree that we shouldn't have to! I think posting our own waymark here for a review by others on the forum is brilliant! Nice catch for a waymark. I'll have to see about getting over there and checking it out. On categories I'm officiating - I'm back in the country, however, I'm filling my camera full of photos and my GPSr full of coordinates and I'll be back approving waymarks no later than the eighth. I actually want to complement officers in several groups - I have been adding a crapton (that's an official Waymarking unit of measure) of new waymarks from my recent travels. Almost everyone is giving responses within 48 hours of posting. Nice job, y'all! I suppose it is time for Wayfrog to work his magic. Not that we think it is his responsibility. Many discussions have taken place on the forums about this issue. We always appreciate Wayfrog assisting with cleaning up pending waymarks. At least at one point, a re-submission would yield results, does not seem to be case currently. Then there's the equally descriptive number which has been brought to my attention by the Frosty Alliums guy. If not yet official, it should become so. What the #$^*%# happened here?!?!?! Where did these images come from, and how, and why?!?!?! I just want to know what's in your "crap" folder. Wayfrog, thank you for your assistance in approving the waymarks. We always appreciate it. Animal hospitals: my waymark was submitted over 6 weeks ago and has not been reviewed yet. Someone else's was approved 2 weeks ago. The category needs a nudge. Thank you. I've got some submissions in the Utah Historical Markers category going back to mid-September. I dropped the group leader a note on 10/26, offering my help, but that won't clear mine. Oh boy... are things that bad these days? So many apparently abandoned categories, from what I read here... shall we do some takeovers then? Looking at the data of the three officers in the Utah Historical Markers category, I doubt that they will return one day. But of course every category is different and the question is: Is there anybody willing to take over that category? The pending waymarks are approved now. Since I've got a Utahn sitting right behind me, I'd be happy to take over the Utah Historical Markers category if there is a need. And thanks to WF for clearing the ones in that category that were pending. The Wayfrog has jumped into action "again". Thanks for the approvals. How are we going to fix this ongoing problem? Wayfrog thanks again for all the approvals today. No problem, your most welcome. These categories are approved by Wayfrog in 2019. The list is most likely incomplete and may not be 100% accurate. If any of these categories are currently active, please excuse the oversight. I did note that most of the listed categories: Enrollment is open. If you are interested in being an officer in any of these categories, please join the group or contact Wayfrog for assistance. Wayfrog, if you are willing you can add to the list of other categories that may need new officers. There are a few with an asterisk (*) that were on the list in 2017. If you have an interest in helping with the publication of new listings then the best first step is to try to contact the Leader and ask them to invite you to be another officer. You can do that through their Waymarking profile directly from the group page. You can also try their Geocaching profile if they seem more active on that site. This is the best first approach. Make sure to save a copy of your attempts to contact the leader. Hopefully they will appreciate your offer and things can progress from there in a way that is mutually beneficial. If you hear nothing after a week or two it is best to contact me directly to move things along. What I will need is a copy of your attempt to promote you. Wayfrog, Happy St. Patrick's Day and thank you for the recent approvals in: Grain Elevators and Vintage Ad Locations.